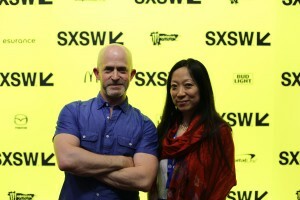 I met with director Miao Wang on Wednesday, March 15, 2017, at SXSW, to discuss her second feature-documentary, Maineland (which follows Beijing Taxi, released in 2010). The new film tells the story of Chinese exchange students who travel to attend Fryeburg Academy, a private boarding school in Maine, to study for three years, focusing on two, in particular, Stella and Harry. Such students increasingly make up for the decreasing American enrollments. The film just received a Special Jury Recognition for Excellence in Observational Cinema at SXSW, and for good reason: Maineland is beautifully shot and structured, and examines issues of central importance to a world that sees America in retreat from its place at the center of it. Here is a condensed digest of our conversation, edited for clarity. Hammer to Nail: Why film at Fryeburg Academy? There are other schools. Please talk about the genesis of the film. Miao Wang: It did not start with Fryeburg. It started with my desire to make a film, after Beijing Taxi – which was focused more on the working class and people going through the changes in Beijing during the 2008 Olympics – which turned to a different group of people, and I wanted to focus more on the middle and upper-middle class, and the topic of education just came up over and over again. It didn’t so much come up as it was just all over the place. Basically, everywhere people were talking about going to study abroad, sending their kids abroad, and it just became really fascinating to me. I have my own personal experience of coming to the U.S., when I was about twelve-and-a-half, and I know that that experience is unique. There are just a lot of stories within that, and that age group, also. And then Fryeburg really came pretty coincidentally. 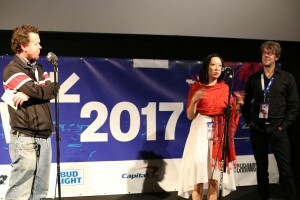 They invited me to do a screening of Beijing Taxi, and I showed up, and I was like, “Wow! This is really far way.” It’s really remote, and in a classic tiny American town, and I really thought that I had been going to somewhere near Portland, Maine, by the coast, and it was an hour-and-a-half inland. And then when I got there, to the school, there was this big group of Chinese kids sitting in the cafeteria, and I just thought that was so fascinating to think of them landing in this small town in the middle of nowhere. What were they thinking before they came and how has that changed? In my mind, I had all these ideas of perception running through. What were their dreams and how is that changing over time? HtN: Are there a lot of American schools that you saw, in the preparation for this film, recruiting in China? MW: Yeah! Although I didn’t go to any school fairs or anything like that until I started following the admissions officer from Fryeburg, but just within China, beyond study abroad, there is just so much talk about education, because people are obsessed, and obsessed with getting their kids into all kinds of night schools, prep schools, weekend classes, everything. And then there are all these agencies that are aimed at getting kids abroad. So tons of different agencies are trying to tell the kids how to get abroad, what they need to do, how to apply to schools, and I knew those agencies existed. Actually, before I started following Fryeburg, I just interviewed a number of kids who were the top students in China, but they were about to apply to college, so it was a little different. HtN: So how did you whittle it down to the two main characters, Harry and Stella? Was it a process of starting with a broader group and then figuring out whose trajectories were the most interesting? Did you initially follow many students and gather footage for all of them, and then in the editing choose just the two of them? MW: So, because I wanted to film the entire process, and wanted to see their lives in China, to film that aspect before they come to the United States – what their dreams were before – to see that moment when they arrive, I didn’t want to film the students who had already been in the school for a while, because then I would have missed that whole transition. So I joined Chris [the Fryeburg Admissions Officer] on the 2012 admissions cycle, and he interviewed about 40 kids, and we filmed all 40 interviews, pretty much, though not each in its entirety, but most of them. Even through that filming, we already knew that we more interested in some kids than others, and we kind of had five kids that we were curious about. Actually, we had a few more, but then we had to figure out which kids were actually going to get in and decide to go. So that became another self-selecting process, and out of that, fourteen came to the school, and out of the fourteen, Stella and Harry were two among them, and there were three others that we were also filming, initially, as well. With at least two others, we filmed their home and family, back in China, but then, once they got to Fryeburg, we were filming all five in the first couple of trips, then three, and eventually mostly just Stella and Harry. HtN: Were the ones who were left out disappointed? MW: Well, that depends…the thing is, some of them…one girl wasn’t really doing anything, really, ever, so what are you going to film. She was either sleeping…(laughs)…or staying up until 3am watching Korean soap operas. So it’s the nature of having something more compelling to film. Also, one of them never got fully comfortable with having a camera on her, and she was always a little too self-conscious in front of the camera, or acknowledging the camera too much, so there were just those things that, eventually…and Stella and Harry just had…Stella had so many more stories. HtN: Well, they’re a nice study in contrasts, the two of them. MW: Exactly! I mean, I like them for that reason, as well. HtN: He’s more introverted, very thoughtful. Not that she’s not thoughtful, but she’s an extrovert and had different concerns, so it’s a nice combination. HtN: Now one thing I noticed in your film is that time seems to accelerate, so the first year at Fryeburg appears to be the bulk of the story. You have pre-Fryeburg and then Year 1 at Fryeburg, and then Years 2 and 3 seem to pass by much more quickly. HtN: Because that first visit home, if I’m not mistaken, is the end of Year 1. Correct? HtN: And then Years 2 and 3 go by faster. How did you arrive at that structure? MW: So we worked with the structure for quite a while. That was definitely something that we spent a lot of time on. It was tricky, because you don’t want people to … at first, actually, we had two trips to China, because I actually filmed them going back three times to China. But how many times can you keep on going back to China? HtN: Is that cinematically interesting every time? MW: Exactly! So, in the end, we decided that we had to figure out a thematic way and to find ways to have a passage of time. We decided to have a couple of scenes with the piano [Harry playing piano]. I see those more as scenes where we feel the passage of time, and you’re skipping through time, basically. And then to have only one trip back to China, so that’s more like a moment of marker. We also tried to consolidate more of the classes in the beginning, and so we definitely worked with the material to structure it in a way that’s more cinematic and less direct timeline. HtN: Plus, that first year is the most momentous for them, in many ways. HtN: One of the interesting things about Stella and Harry is the irony of how Stella, who starts out as the more extroverted one with all the friends, ends up deciding that she wants to go back to China, and ultimately says, “I don’t get Americans.” But Harry, who keeps much more to himself – although you do show that nice interaction with the blonde girl at the end – is the one who, at the end, has opened up, and wants to maybe work for the U.N.
MW: Yeah! He’s studying international relations, now. HtN: I like that reversal. So you got lucky … well, not lucky, it was also smart choices. HtN: Did you have any concerns filming these underage students doing things like smoking and drinking, particularly as it might reflect on either the restaurant owner we see or the staff at Fryeburg? I’m just curious how you considered those scenes. MW: I mean, I did think at one point that maybe I shouldn’t show…I mean, it’s not as if we show the actual beer, itself…they were drinking in foam cups. But then, what high-school kids haven’t done that? It’s not like they’re doing something much worse. It’s just so common. Even the teachers, I think, know that they do it, and they reprimand them, and they tell them not to, but it’s sort of minor, to a certain extent. HtN: As a former boarding-school teacher…ahem…(laughs) … I can tell you that yes, people are quite aware these things go on, and certainly these students have long since graduated, but I was just curious to know your thought process. HtN: Well there you go! So you thought about it. Now, I like the fact that you subtitle your characters, even when they’re speaking English. HtN: It is helpful to an audience perhaps not used to hearing accents beyond the typical American accent. But not everyone does that in documentaries. How did you make the choices of where to do it and where not to? MW: Actually, to the last minute, I kept trying to decide, “Should I put subtitles there? Should I not?” It was definitely an ongoing decision. And there were even a couple of places where I decided to wait until the sound mix was done to see…because I wanted to make sure that you could hear what they’re saying. We did lift the subtitles out of a couple of places where we had them before, because I realized that people could understand what they’re saying. I would prefer to have fewer subtitles, just because you want people to watch, instead of read, but there were a couple of places where it just felt like it would be important. HtN: Right. So your cinematographer is Sean Price Williams, who is a very prolific cinematographer in the independent-film world, doing both fiction and nonfiction work. This film was made over three years. He’s listed as the cinematographer, but since he’s so otherwise prolific, were there other people shooting, as well? And how did you start working with him, to begin with? MW: I’ve worked with Sean for ten years now. We worked on Beijing Taxi together – that was our first collaboration – but I initially met him because I was editing a small experimental film that a mutual friend was directing, that he had shot, and while I was editing the footage, I fell in love with it. I was like, “The cinematography is amazing!” (laughs) Just the raw footage was incredible. And I actually was working with someone else, in the beginning, for Beijing Taxi, and then, for various reasons, he couldn’t continue, so I was looking for someone else, and that was when I approached Sean. Our mutual friend had said that Sean had always wanted to go to China, and since then we’ve been to China many, many times. He filmed most of Maineland. I kept trying to figure out what the percentage was, but there was a year where he was not really available very often, because he is so busy, and is working on so many projects … every year he has like ten more films on IMDb, which is insane!…(laughs)…so at that time, I actually ended up filming a lot of stuff, myself. And I thought I would take those moments whenever he wasn’t available to focus more on the girl, to be in the girls’ dorm, because it’s a little harder for him to do that, so that was when I filmed a lot of the girls’ dorm interactions. HtN: What cameras were you working with? MW: We were shooting, in the very beginning, on the [Canon] 5D Mark II, because that was before the Mark III came out, and then we pretty much shot the whole film on the Mark III, after that, which when I watched it on the big screen, I thought looked pretty good. I liked the image a lot! I’m impressed how a little camera like that actually has a good image. So I shot sections of it and Shaogung Sun, who operated on Last Train Home, shot parts of it, in China. He also shot China Heavyweight. He’s one of the best cinematographers in China. So whenever Sean wasn’t available, in China, I would have him shoot, instead. HtN: Well, Miao, thank you so much. It’s a beautiful film. And congratulations on your award.